On 12th September the University of Leicester held an extraordinary press conference. They announced that a three week dig seeking the remains of Richard III had ‘entered a new phase’ with DNA testing under way on an adult male skeleton. So what had they discovered? Richard Buckley, Jo Appleby, and Helen Foxhall Forbes told Matthew Symonds and Carly Hilts. He has become one our most celebrated literary villains: a power-crazed child killer struck down by bloody nemesis at Bosworth. Shakespeare’s Richard III is a murderous hunchback twisted both inside and out by the deformity that repels his peers. But while this spectacular character assassination plays fast and loose with historical events, Shakespeare’s monster is merely the fullest flowering of a Tudor drive to discredit the last Plantagenet king. This victor’s history has proven so effective that controversy rages to this day about almost every aspect of the man behind the myth, right down to the true nature — if any — of his famous disability. 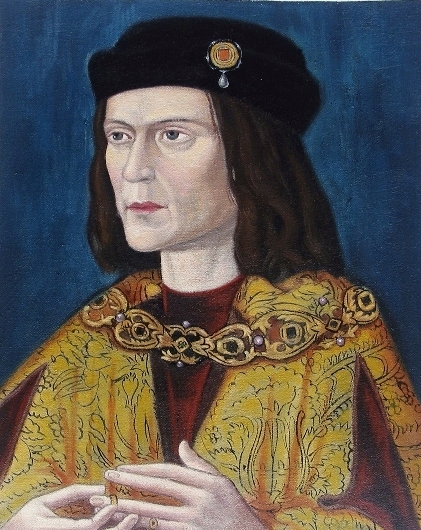 Richard III’s short reign ran from 1483-1485. Appointed Lord Protector of the 12-year-old son of Edward IV following the king’s death, Richard was soon on the throne himself. After Edward IV’s marriage was declared invalid, Richard’s coronation followed on 6th July 1483. It proved a controversial start to a controversial reign. Dogged by accusations that he had murdered the princes — Edward IV’s sons — in the tower, and facing political unrest Richard proved unable to consolidate his grip on power. Instead, on the 22nd August 1485 his army was defeated by Henry Tudor’s at Bosworth Field, west of Leicester. Killed during the battle, Richard III became the last English king to fall in combat. It is recorded that after the battle Richard was ‘brought dead off the field unto the town of Leicester, and there was laid openly, that every man might see and look upon him.’ What happened next is less clear. 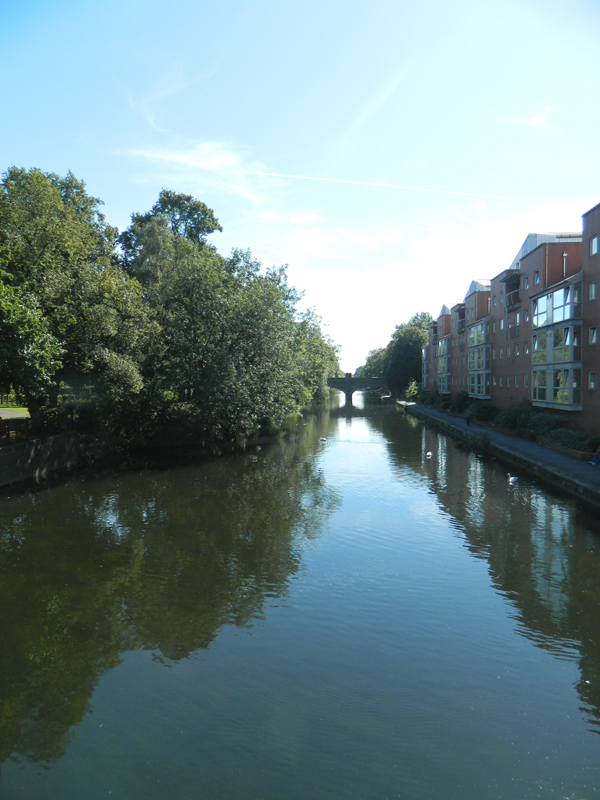 Many myths have grown up about the fate of Richard’s body, including a tradition that it was hurled off Bow Bridge into the River Soar. In around 1490, however, John Rous noted that Richard ‘finally was buried in the choir of the Friars Minor [Greyfriars] at Leicester.’ Further Tudor sources also name Greyfriars, while a sum of £10 1s drawn from Henry VII’s household accounts in September 1495 seemingly paid for Richard’s tomb there. Locating the friary — and in particular its church choir — seemed a promising start for any attempt to find his body. Founded by the Franciscan order in 1230, Leicester Greyfriars was one of the first friaries built in England, but it suffered the same fate as many other religious buildings during the 16th-century Dissolution of the Monasteries. In the years following its suppression in 1538, the friary was plundered for building materials — recycled in numerous local construction projects and repairs to nearbySt Martin’s church. Over time its precise location was lost. 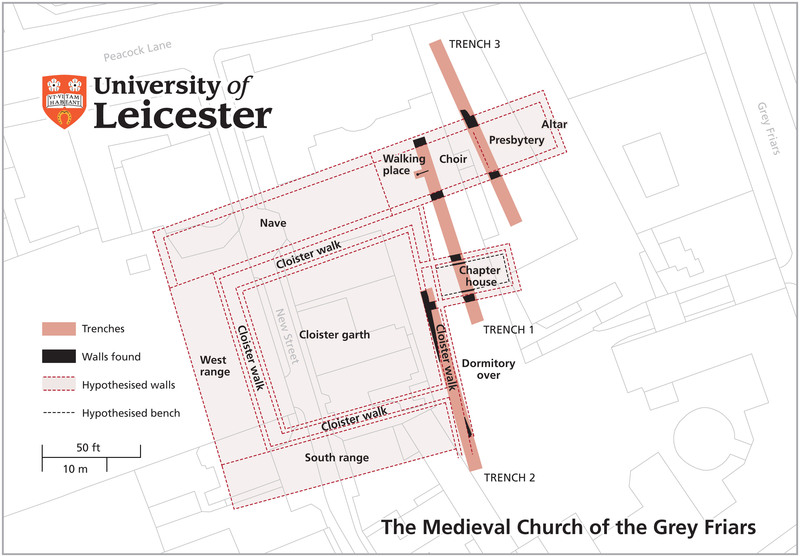 When the Richard III Society approached University of Leicester Archaeological Services’ (ULAS) Richard Buckley about the possibility of an excavation to find the friary’s church – and Richard III’s grave site – it seemed like a long shot. Historic mapping suggested that the most likely location for the religious complex was now covered by modern redevelopment, with just one accessible area: a small carpark behind the buildings of Leicester City Council. With no guarantee the body had survived the Dissolution — if it had ever been there — Richard Buckley summed up the odds by offering to eat his hat if they found the missing monarch. But as there had never been an archaeological investigation of the site, the project seemed like an opportunity to examine the friary itself. Preliminary work in the carpark using Ground Penetrating Radar (GPR) was not promising, revealing modern service pipes but nothing to suggest the presence of a Medieval religious complex immured beneath the tarmac. This is not an uncommon issue for archaeologists in Leicester, where the deep and complex urban stratigraphy often defies GPR survey. Undeterred, the team decided to excavate two long, narrow trial trenches running 30m north-south. They reasoned that as a religious site is likely to be oriented east-west, cutting trenches across this axis should pick up at least some of its walls. It proved an inspired tactic. In the second of the two exploratory trenches, the ULAS team found the remains of two parallel walls about 2m apart. Running between these was a mortar floor that clearly preserved the impressions of diagonally laid square tiles. While these had been removed during the friary’s demolition for reuse elsewhere, many broken tiles were dumped as rubble. Some were locally made and feature colourful decorative motifs familiar from ULAS investigations at nearby Medieval sites such as Leicester abbey. 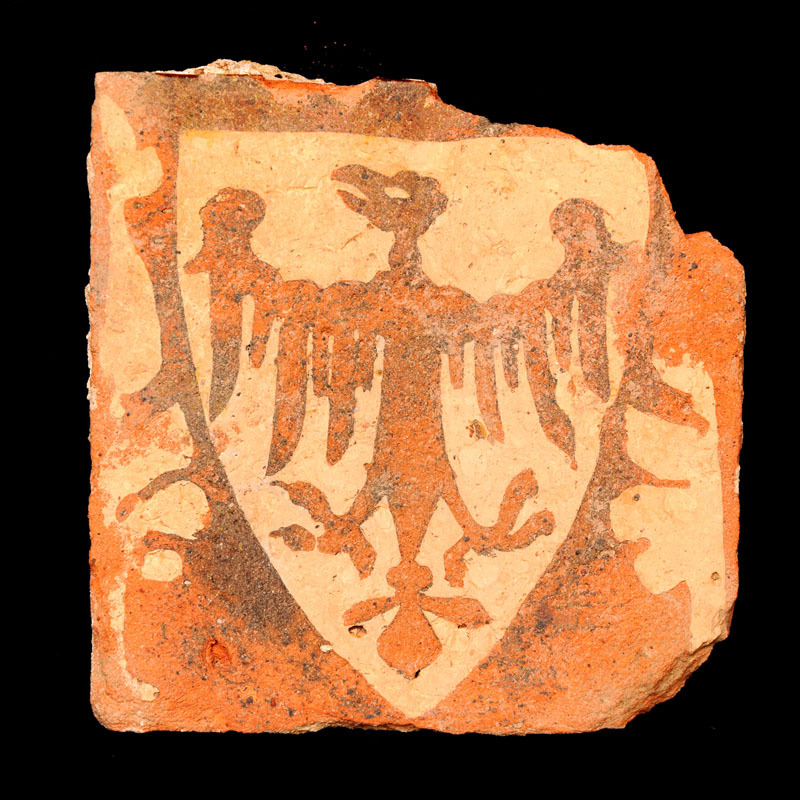 Others came from further afield, with a fine example from the Wessex group of tiles displaying an eagle design. The narrow walkway was clearly a passage of some kind, and given the religious nature of the site, the team wondered whether they had found part of Greyfriars’ cloisters. If confirmed, the friary church was likely to be nearby – and if they could only establish which side of the cloister range they had unearthed, they could extrapolate the best place to look. Another key piece of the jigsaw emerged in trench 1: two robbed out walls from a 5m-wide building that joined the cloister walk at a right angle, and which also had a mortar floor marked with tile imprints. Against each of the wall lines was a large block of stone: the remains of benches where monks sat during meetings about the daily running of the friary. The team had found Greyfriars’ chapter house. By comparing the site’s layout to plans of other friaries, this suggested that they had located the eastern side of the cloister range. The church was likely to be close. Current Archaeology – Richard III’s death blow revealed?